All equipment and cutting tools are in front of the machine to guarantee the utmost visibility and control for the operator. The front deck ensures that the grass is cut before being trampled by mower wheels resulting in a clean, even cut. 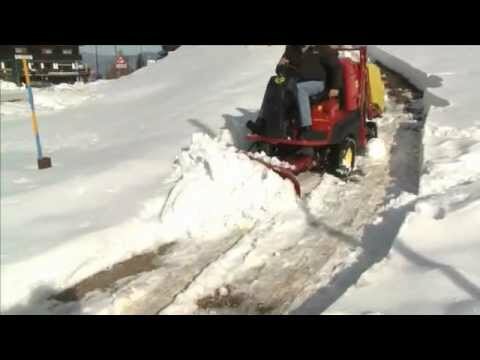 Additionally, the front deck also allows the operator to cut under bushes and makes finishing around trees, flower beds and walls easier. 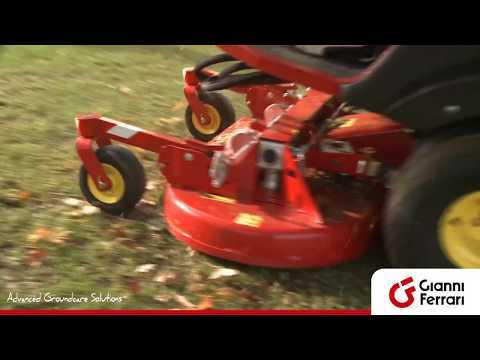 The GT features counter-rotating blades that impart a strong aerodynamic thrust and send the cut grass directly into the grass collector. 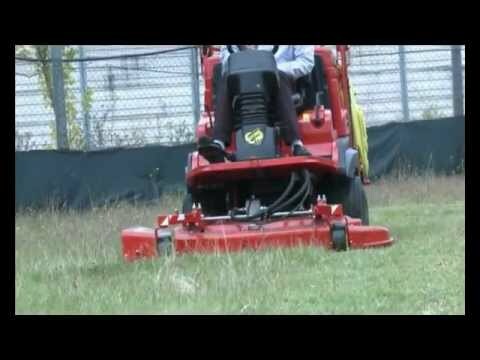 The wide built-in collection tube, thanks to its special shape, allows for extra acceleration to the cut grass. The direct grass collection system prevents clogging even in tough conditions with tall, moist grass. 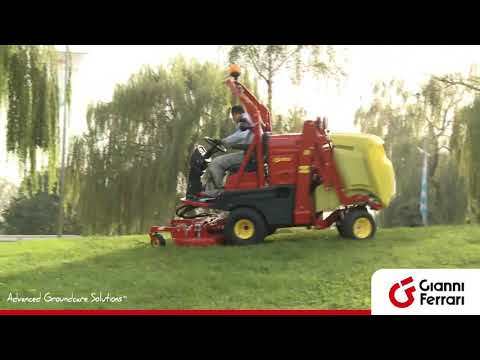 Its large, 550-litre grass collector is made of shock resistant materials and it is equipped with air deflectors that ensure maximum filling and that direct dust backwards in order to offer favourable working conditions. 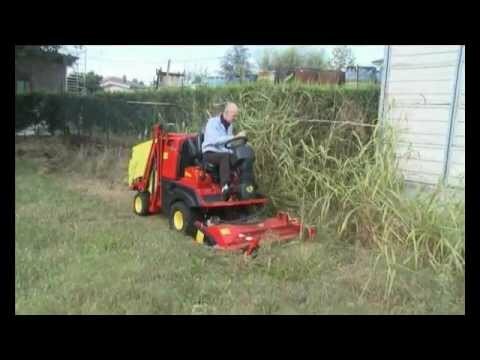 A simple to activate joystick controls hopper emptying at the chosen height; it is possible to dump the grass at 75 cm from the ground or lift the hopper up to 200 cm in order to unload the grass directly in the body of a truck or trailer. GT driver’s position was designed to offer maximum ergonomics and comfort in use. The seat is fitted with armrests and a high backrest, as well as having adjustable suspension to allow the operator to work without tiring. The steering column is adjustable and the steering wheel is ergonomic with a soft handgrip and knob. All controls are easy and user friendly with ergonomic levers and shaped handle. On the dashboard, a digital display provides information on the operation of the machine (hour meter, engine water temperature, fuel reserve, etc.). It also display diagnostics information relating to the safety and performance of the mower. Besides benefits such as comfort and effectiveness, having the deck and attachments mounted out-front offers great versatility. 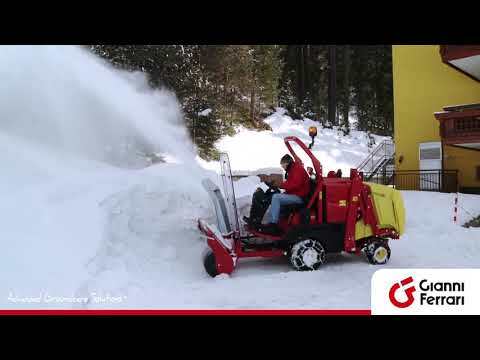 The range of tools especially developed for GT allows for all-year-round use. Replacing equipment is very quick and easy as it does not require the use of tools. It can be carried out in just a few seconds thanks to the quick-release couplings and quick hitch ends of the front linkage. The direct collection of grass is a remarkable advantage in terms of machine simplicity, resulting in fewer wearing parts which ultimately have to be replaced. The hydraulic PTO, instead of mechanical power take off, does not require the routine maintenance typical of mechanical transmissions (belt tensioning, greasing of cardan driveshaft, tensioners and bearings, etc.) Only one belt is used throughout the machine. This syncro transmission belt is over-dimensioned to ensure longevity. It is also self-tensioning and maintenance-free. The PTO quick couplings are flat face-type for easy cleaning The over-dimensioned hydraulic components guarantee the reliability of the system and keep temperature and pressure low, promoting a longer oil life and therefore lower maintenance costs. • it guarantees constant drive to all 4 wheels for operator safety. The servo-assisted pressure divider subdivides the torque on both wheels in order to have the effect of a differential lock. GT is equipped with low-emission engines that are fully compliant with the current anti-pollution directives. The oversized radiator with anti-clogging fin is raised and keeps clean longer also in difficult conditions. The filtering system with self-cleaning, cyclone-type pre-filter protects the engine and lengthens its life. GT models supplied with a road legal kit (front and rear lights, indicators, flashing beacon, horn, etc.) 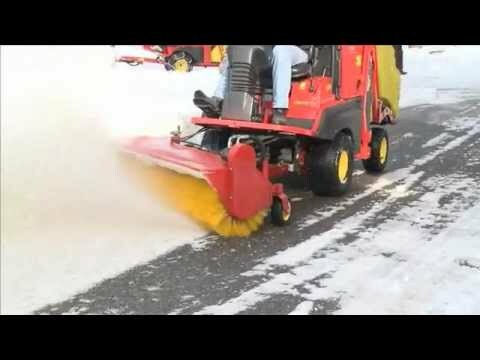 can be used on public roads. According to the type approval received, it is legal to drive on roads with the traction unit only, or with all the attachments stated in the vehicle registration document. It is also legal to drive with either a full or empty hopper.